Editor’s note: Ad-blocking (and online advertising in general) is a controversial subject. Some dislike ads altogether, and block them on principle, others say this robs publishers of income. This tutorial is one developer’s attempt at a compromise. What do you think? Let us know in the comments below. In this tutorial, we will create a WordPress plugin that can disable the website for users using AdBlock or display alternative ads to AdBlock users from the same domain as the website. This plugin can be useful if your website is completely dependent on ads for generating revenue and where users consume a high amount of resources. For example, a video sharing site may want to ban a site from playing videos or display alternative ads for AdBlock installed users. One such example is TED.com, as shown above. 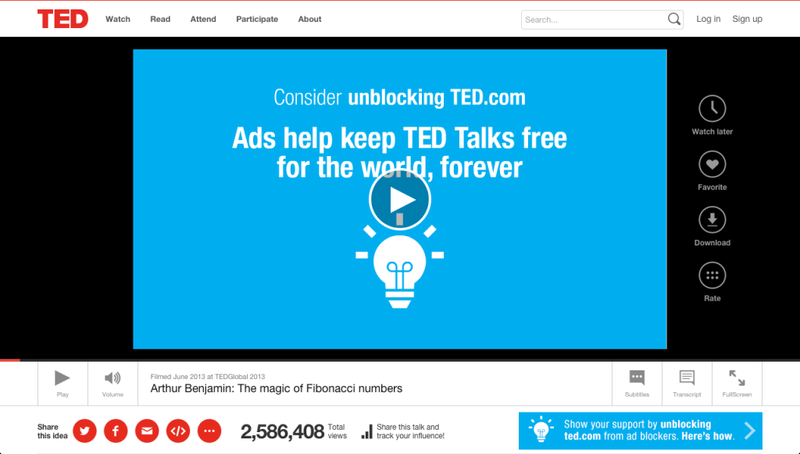 You can see TED.com requests you to unblock ads for their site. AdBlock maintains a list of various advertising network domain names and a list of advertising specific keywords. AdBlock works by blocking image, iframe, script and Flash HTTP requests that match known advertiser domain or advertiser specific keywords that are on their list. After the requests are blocked, it also changes the CSS properties of the blocked HTML elements to hide them. AdBlock allows you to expand on what can be blocked by adding filters. Alexis Ulrich has written about ad blocking technology if you’re interested in reading more on the topic. alternative is the plugin directory. If you want to change the name, that’s fine. Just make sure you don’t call it anything that the keywords specific blocking would trigger, otherwise enqueuing of index.js will fail. First, we need to add a Anti AdBlock settings page to WordPress admin panel. Before we create a settings page, we need to create a sub menu item for the ‘settings’ parent menu item. Here’s the code we’ll use to create a sub menu item. Place it in the alternative.php file. This code creates a menu item and attaches a settings page to it. Next, we need to use the WordPress Settings API to populate the Anti Adblock Settings page with desired options. 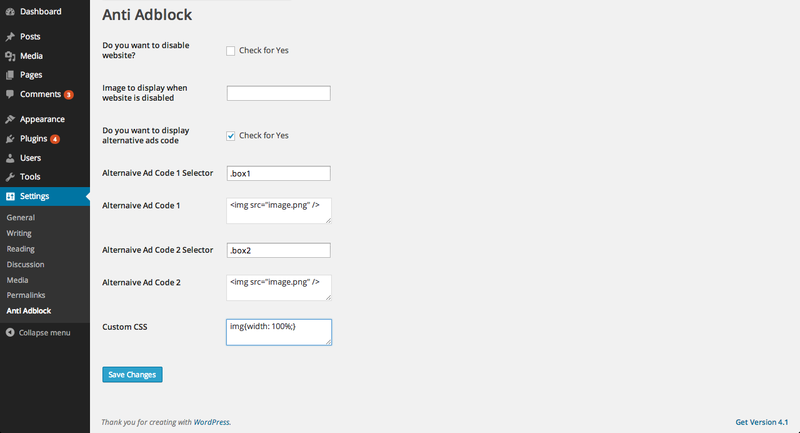 Here’s the code for displaying various options on the settings page using the WordPress Settings API. Place this in the alternative.php file. This is where we can choose whether we want to display alternative ads or disable access to the website completely for users with AdBlock installed. I am assuming that your website has two advertising placements. If you have more than this, add more fields to the settings page. For alternative ads, you first need to provide the selector for the HTML element which holds the ads and then the ad code. Make sure that the ad code doesn’t have any advertising specific keywords or that their URL isn’t pointing to another advertising network. Otherwise they too, will get blocked. You can find selector of your ads container by inspecting the elements using your browser development tools. This will provide you with the class name or id of the HTML element. Finally, we have an input box to add custom CSS to style the alternative ads. This CSS is flushed into a custom.css file which will be embedded on the front end. Place the following in the alternative.php file. //change this if your are adding more fields. Once we’ve detected if AdBlock is blocking ads on our page, we need to act, based on our plugin settings. Add the following code to the index.js file. Below is the complete source code for our AdBlock plugin. 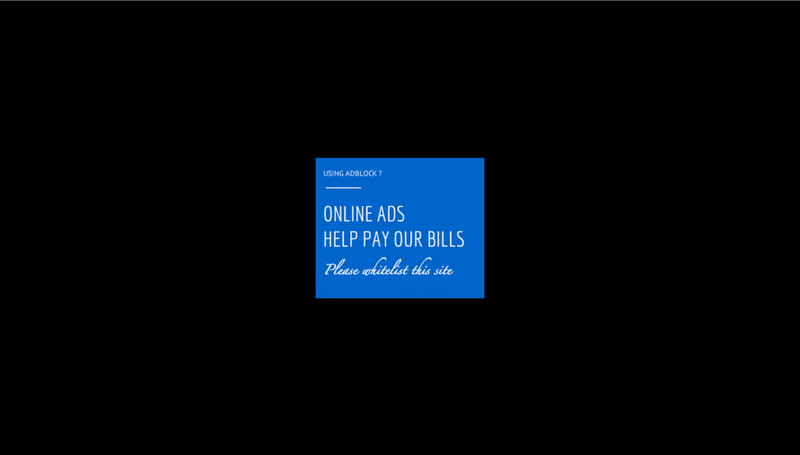 Description: This plugin lets you display alternative ads and also lets you disable website. This is how it looks when you disable the whole website for AdBlock users. This is how it looks when you want to display alternative ads. As mentioned previously, when providing images when the website is disabled, make sure that the image URL doesn’t contain any ad specific keywords. Otherwise they will also get blocked. Similarly, make sure alternate ads don’t point to any other advertising network or don’t point to URLs with ad specific keywords. Otherwise the alternate ads will also get blocked too. In this article, by alternate ads I’m referring to ads serverd from the same domain. From my own analytics data I can say that 25% of website visitors use AdBlock. If you’re serving ads from ‘pay per impression’ networks then this plugin could increase your website revenue by 25% right away. If you don’t want to block your site, then you can use the alternate ads feature to request the user to whitelist your website. While I will empathise with webmasters/coders who rely on ads to generate the revenue necessary to keep a site afloat, the inarguable fact is that most of the ads being used, today, are bandwidth choking, or have something about them that makes it really difficult/slow to load the desired content. You post a way to flout AdBlock. Someone will improve AdBlock to thwart that. Someone else will devise a way to cripple that. And so on.. and so on.. and so on.. Instead of propagating a war that will never be won by either side, how about implementing ads that are NOT intrusive, or don't impede the process of delivering the content that the user originally WANTS to view? I especially hate ads that use video, and even more if the video plays automatically upon page load. The same purpose can be achieved with a simple, non-animated banner ad across the top of the page. But marketing gurus don't like that because it's not "in your face" enough. Which is why third-party plugins like AdBlock were created, in the first place. I use AdBlock on my browsers, at home, and love it. What you are promoting will serve only to alienate much of the target demographic, and cause many users to avoid a website/page until another "solution" to block your solution is presented. So sites will need anti flash block as well? I donâ€™t need to visit any site that insists upon abusing me. But good sites sites like youtube do have flash ads but they have an option to skip it too. When going to YouTube using IE, I've NEVER seen an option for skipping the ad. When that happens, I close IE and open the same page in FF, and AdBlock skips the ad. Well designed sites like sitepoint.com do have a lot of ads but they are relevent and are loaded asynchronously. SitePoint has ads? I'm using my work computer (FF without AdBlock) and the only things that I see that can be considered "ads" are some of the articles that are then posted to the forums that will reference a specific SP book. Of course, 99.99% of the time I spend on SP is in the forums. This plugin is not just to fight back adblock rather you can use it to request user to whitelist your site. And thats what I have shown in the demo. I'll admit that I didn't click the link to read your whole article. I stopped at the end of your original post. However, the picture that you included in your original post doesn't seem to display a link allowing the user to skip the ad; rather just a link for a "how to" on whitelisting the domain. I'll check the article more thoroughly. I recently (last 3-4months) uninstalled AdBlock from all my browsers and I'm actually thinking about turning it back on JUST for YouTube because of this. The amount of ads with a skip button get less and less. It used to be every ad was skippable, then it was like 1 in 5, now it's about 50/50 and seems to be shrinking and the unskippable ads seem to be getting longer. I'm actually one of the weird ones, I like page ads. Especially targeted ones. It's not a bad way to catch good deals on stuff, plus the site owner who displayed it gets a cut. "Not all ads are equally annoying: the study found that the majority of adblocker users are willing to view non-intrusive ad formats. "In fact, if ads could manage to keep themselves from cartwheels, barking or blocking the content users are trying to view, instead choosing to quietly and unobtrusively advertise with text or image ads, 67% of adblock users said they'd be OK with it, PageFair found."